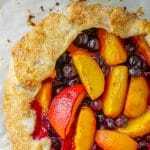 Summer Fruit Galette - a super simple recipe to use whatever summer fruits and berries are on hand in a quick dessert that's perfect with a scoop of creamy vanilla ice cream. 1/4 to 1/3 cup ice water Only enough to make a dough form. Divide dough into 2 balls, flatten into 2 rounds, wrap in plastic wrap and place in the refrigerator to rest for a minimum of 20 minutes. You can freeze the second pastry round to use another time. You can make your dough the previous day but make sure you take it out of the fridge for 10 minutes to warm slightly before rolling out. Roll the dough into a 12 inch round and place it on a parchment lined cookie sheet. Toss together the fruit with the cornstarch and pinch of salt. Pile the fruit mixture in the center of the pastry and then just simply bring the edges of the dough up over the fruit, overlapping and gathering the pastry as needed to form about a 2 1/2 inch edge crust. Bake at 375 degrees F for about 40 minutes or until the crust is golden brown and the fruit is bubbling at the center. Allow to cool for at least a half hour before cutting.